Tap left: The Tennessee Valley Authority, pairt o the New Deal, bein signed intae law in 1933. Tap richt: Preses Roosevelt wis responsible for initiatives an progremmes o the New Deal. Bottom: A public mural frae ane o the airtists employed bi the Works Progress Administration, pairt o the New Deal. The New Deal wis a series o domestic programs enacted in the Unitit States atween 1933 an 1938, an a few that came later. 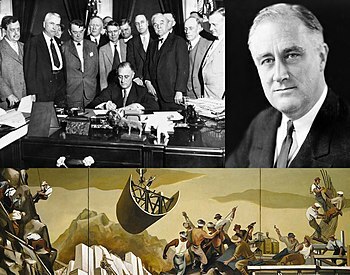 Thay includit baith laws passed bi Congress as well as presidential executive orders during the first term (1933–37) o Preses Franklin D. Roosevelt. This page wis last eeditit on 4 Februar 2016, at 03:01.